Sierra Leone's Revolutionary United Front(RUF) was a rebel army that engaged in a failed armed struggle to overthrow the government of Sierra Leone from 1991 - 2002. 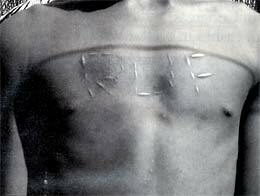 The RUF recruited child soldiers(involuntarily), who were then branded with the "RUF" letters to permanently mark them as rebel soldiers. This made it difficult to impossible for RUF soldiers to desert, as their scars would invariably lead to them being executed for their presumed affiliation by the government. The RUF were also infamous for amputating the hands, arms and/or legs of civilians, to prevent them from growing food or engaging in economic activity which would contribute to the stability of the government. Tens of thousands of civilians were mutilatied in this way during the conflict. This page was last modified on 13 May 2006, at 05:12.